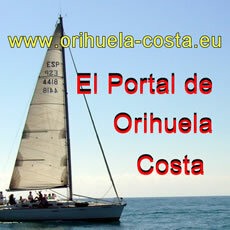 The Orihuela Costa Branch meets at 7.00pm on the third Thursday of every month at the Olympia restaurant in Mil Palmeras, just off the N332, midway between Cabo Roig and Pilar de la Horadada. The British Legion was founded in 1921 as a voice for the ex-service community as a merger of four organisations: the Comrades of the Great War, the National Association of Discharged Sailors and Soldiers, the National Federation of Discharged and Demobilized Sailors and Soldiers and the Officers' Association. It was granted a Royal Charter on 29 May 1971 to mark its fiftieth anniversary which gives the Legion the privilege of the prefix 'Royal'. Earl Haig, British commander at the Battle of the Somme and Passchendaele was one of the founders of the Legion and the President until his death. The head office is based (2015) next to Borough tube station. 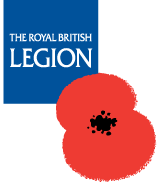 Perhaps best known for the yearly Poppy Appeal and Remembrance services, the Legion is a campaigning organisation that promotes the welfare and interests of current and former members of the British Armed Forces. The Legion support nearly 36,000 War Disablement Pension cases for war veterans and make around 300,000 welfare and friendship visits every year. Legion campaigns include calls for more research into: Gulf War syndrome and compensation for its victims; upgrading of War Pensions; the extension of endowment mortgage compensation for British military personnel serving overseas; and better support for British military personnel resettling into civilian life. 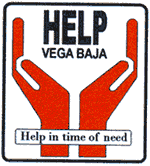 HELP VEGA BAJA is a registered charity which provides assistance all year round to anyone in their time of need. We have offices in Torrevieja and San Miguel de Salinas and an Help Desk in La Marina from where we provide both residents and visitors to Spain with a wide variety of local advice, such as information on Residents Certificates, Registering with your Town Hall, car registration, procedures on death. The offices also act as a point of contact for anyone seeking local information on English speaking services and trades people. We stock a large range of Orthopaedic Equipment and can provide this for hire at a very reasonable price. We provide a team of Hospital visitors who attend the Hospitals in Orihuela and Torrevieja to contact the English speaking patients. We have a Friendship Centre that meets weekly. We have a Diabetic support group that meets monthly. We can help when there is a death in the family, our Volunteers being well versed in all aspects of such events and are able to give advice as to the procedures to be followed in such circumstances. We have Fact sheets on a wide range of subjects. The Emergency Contact Scheme helps our members in an emergency. We also have a register of locally based translators, nurses and carers who provide their services for a fee. If you would like any more information please come and see us at either of our offices or contact us by telephone on 966 723 733. Vecinos Colaborando is a community group whereby the people of an area organise themselves in an effort to combat crime. They adopt the thinking “if it affects my street or my neighbour then it affects me”. WHAT IS THE HISTORY OF VECINOS COLABORANDO? In the late 1970’s in a poor area of Alabama in the southern United States of America, the residents were being subjected daily to street crime, car crime, drug related abuse, assaults and thefts. The police would appear but once they had gone, crime continued. The residents decided to take action by noting suspicious persons and incidents, and reporting these to the police who then responded, with the result that the criminals either moved on or were arrested by the police. Vecinos Colaborando groups are now in existence in a number of different countries throughout the world. WHAT ARE THE OBJECTIVES OF VECINOS COLABORANDO? 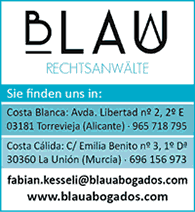 To inform the Policia Local or Guardia Civil of the occurrence of suspicious incidents. To quickly alert all residents of the occurrence of suspicious incidents. To keep residents informed of different types of crime being committed in the area. To advise generally how residents can protect their property and themselves. WHY DO WE NEED VECINOS COLABORANDO? By noting suspicious persons or incidents and informing the Policia Local or Guardia. We can help them to help us to protect ourselves and our property, and generally make our areas safer to live in. It will also bring communities together. Hopefully YES. It has shown to be so in America and in other European countries. However, it can only play a part in reducing crime, and the more groups of residents participating, the more effective it will be. DOES VECINOS COLABORANDO HAVE THE BACKING OF THE AUTHORITIES? In Orihuela Costa most definitely YES. Vecinos Colaborando is greatly supported by the Town Hall. The Policia Local and Guardia Civil respect, and are enthusiastic about the co-operation they receive from Vecinos Colaborando groups. Groups do not patrol streets. Members do not carry sticks or other weapons. Members do not confront suspicious persons. 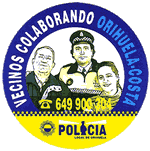 These activities are only for the the Policia Local or Guardia Civil.